Here’s what’s up in the world of TV for Wednesday, January 25. All times are Eastern. Arrow (The CW, 8 p.m.): Arrow is back with its winter premiere, and it looks like things are pretty serious and dramatic. “Oliver wants Justice; Felicity wants revenge.” See? Seriously dramatic. 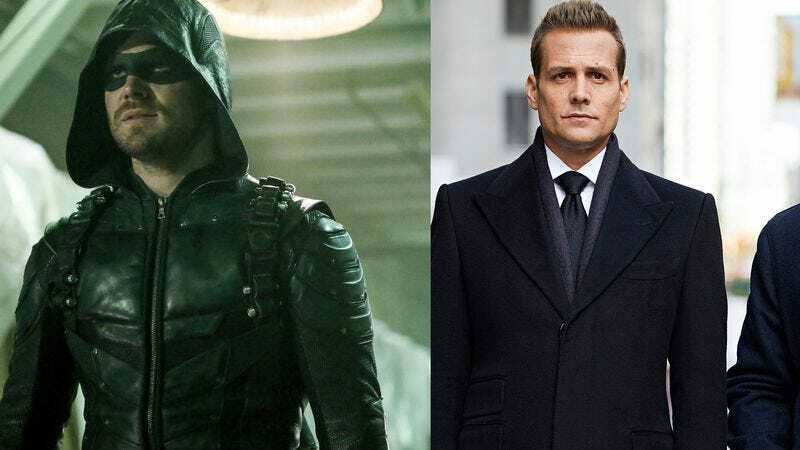 “Worried that Prometheus is right and he is truly a killer at heart, Oliver looks for any ray of hope and finds it in what seems to be the miraculous return of Laurel Lance (guest star Katie Cassidy). However, Felicity, still reeling from Detective Malone’s murder, is bent on revenge—she wants to stop Prometheus at any cost.” No one should ever expect a grown-man character called “Billy” to live a long life. Ally McBeal taught us that. Anyway, ignore that the original extended trailer spoils the entire plot and get ready for this and Alasdair Wilkins’ review. Frequency (The CW, 9 p.m.): It’s a “Signal Loss” in Frequency’s first season—possibly series—finale. “Raimy makes a discovery that stops her cold. She quickly reaches out to Frank on the ham and voices her concerns. Meanwhile, truths are revealed.” Oh, like the Nightingale truth everyone watching figured out weeks before the show revealed it? The real question is: Will the show ever explain why Raimy can’t stop making bad decisions, both personally and professionally? Or prove that Gordo’s wife and kid aren’t just a figment of his imagination that Raimy goes along with because she’s afraid he’ll snap? These are the questions reviewer Gwen Ihnat really wants the answers to. Suits (USA, 10 p.m.): Suits is back, and Gina Torres is not. Naturally, tonight’s sixth-season winter premiere is titled “She’s Gone.” “Harvey, Louis and Donna plan for the future, after Jessica’s departure from Pearson Specter Litt. Mike discovers the perils of life as an ex-convict. And Rachel considers her options for life after law school.” Take a deep breath, as you’re going to need it knowing the show will focus on Mike’s “hard” life as an “ex-convict.” Then wonder what this synopsis is talking about regarding Rachel’s “life after law school.” She went to law school with the specific goal of working for Pearson Specter Litt Florrick Lockhart, or whatever it’s called now. Miss you already, Gina Torres. Hunted (CBS, 8 p.m.): Just when you thought, “I’m good, CBS,” Hunted shows up with a two-hour episode and time-slot premiere. In “Snitches Get Stitches” (they’re invoking gangsta law here), “the Command Center investigators and Hunters in the field are challenged by the ingenuity of several fugitives, including one team that goes off the grid entirely, and another pair who believe they’ve devised clandestine ways of communicating with their friends and family.” Fine. But what about Melissa George? The Magicians (Syfy, 9 p.m.): The Magicians returns tonight for its second season: “In the aftermath of their clash with The Beast, Quentin and his friends scramble for a new plan, while Julia and The Beast strike a dangerous deal.” In her review of the season-one finale, Lisa Weidenfeld wrote that The Magicians created “a whole mess of problems to fix in season two.” Time to see if it will fix them. Bakers Vs. Fakers (Food Network, 10 p.m.): We’ve got ourselves another series premiere with Bakers Vs. Fakers, in which “four competitors battle it out each episode for ultimate bragging rights and a cash prize, as Buddy Valastro hosts new culinary competition series Bakers Vs. Fakers.” So what you’re saying is… this show should really be called Cake Boss Vs. Fake Boss? That’s definitely what we’re saying. Alzheimer’s: Every Minute Counts (PBS, 10 p.m.): This PBS special is “an examination of the social and economic crisis that America will face unless a cure for Alzheimer’s is found.” If you want some heavy hump-day viewing, this is definitely your best bet. Charmed, “All Halliwell’s Eve” (Amazon Video/Google Play/iTunes/Netflix/vudu/YouTube): Salem is out, but you can still watch the episode of Charmed where they go back in time to the 1600s. If you thought Salem was historically inaccurate, you’ve clearly never seen this episode. Also: Long live Phoebe/Cole!